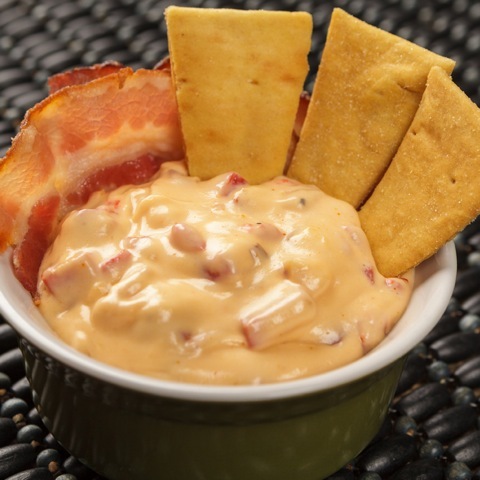 Hot sauce and Carolina Pride bacon give this Southern classic a rich, spicy twist. Chop half of the bacon and cook in skillet until browned and crispy. Set aside.Bake remaining bacon on parchment paper on cookie sheet at 400°F for 15-20 minutes or until crispy. Melt cream cheese, cheddar and pepper jack in slow-cooker on high setting. Mix in mayo. Dice roasted red peppers and place on several paper towels, along with the pimentos, and pat dry. Add peppers and pimentos to slow-cooker. Add remaining ingredients, including chopped bacon, and mix well. Garnish with cooked bacon slices. Lower heat to low or warm setting on slow-cooker. Serve warm with pita chips.